Why is the xtava Pro Satin Infrared Hair Straightener so Effective at Straightening Fine Hair? Are you like most people that worry about straightening their fine hair with high heat? Unfortunately, high heat is a necessary evil when it comes to straightening fine hair. Manufacturers can add certain features to a flat iron that help minimize the damaging effects of high heat on your fine hair. 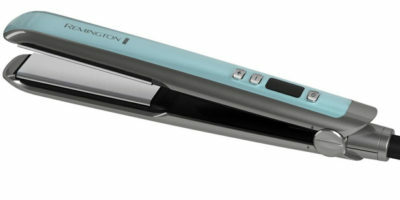 One such flat iron like this is the xtava Pro Satin Infrared Hair Straightener. Fine hair users of this flat iron say that it straightens their hair very nicely yet does not damage it. A statement like that definitely gets our attention so we think it’s time to review this flat iron. People like the performance of this flat iron despite the type of hair they have. The reason for this is because of such things as its wide variety of heat settings. Ther are ten heat settings to choose from between 265ºF to 445ºF. The heat used to warm the larger size 2” wide ceramic tourmaline plates on this flat iron is produced by far-infrared means. That is a very gentle type of heat for fine hair. Ceramic coating plates also heat evenly across them so they have no fine hair damaging hotspots on them. 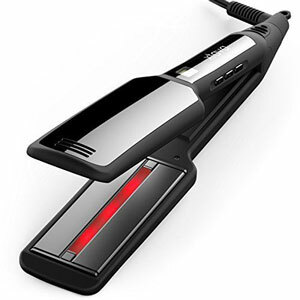 You can easily select the heat you will use this flat iron at using its soft touch buttons and its digital display. That temperature can also be locked in place so your flat iron comes on at the same working temperature every time you use it. 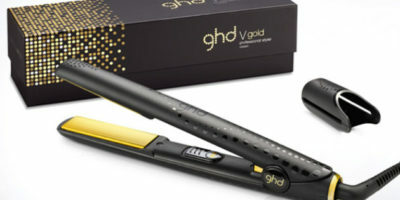 This is a great flat iron to take with you as you travel too. It locks shut and it is dual voltage capable so you can use it in just about any place in the world. The 8-foot power cord that comes with it has an anti-tangle swivel end attached to it too. Ok, so what is it about this flat iron that makes it good to use on fine hair? One thing is the fact that its heat is produced by infrared means. Infrared generated heat tends to heat a strand of hair from the inside out. This makes it a very gentle form of heat which is great for anyone with fine hair that uses this flat iron. Its 10 different temperature settings give you many choices for your fine hair too. Especially since the lowest heat setting is a gentle 265ºF. That is really the type of temperature where you need to start when straightening fine hair. The warranty on this flat iron from xtava is neither good nor bad. If you purchase it you will be covered by its warranty for a period of 2-years. We did have some complaints about this flat iron too. One of them is the fact it feels a little bulky and heavy when using it for long periods of time. The xtava Pro Satin Infrared Hair Straightener weighs almost 2 pounds. If you find yourself in a hurry to get your fine hair ready every morning then you may not be too happy when you purchase this flat iron. It takes almost a full 2–minutes for it to heat up. We all really liked this flat iron from xtava. It’s a flat iron we can see being really gentle on fine hair that tends to get damaged easily. 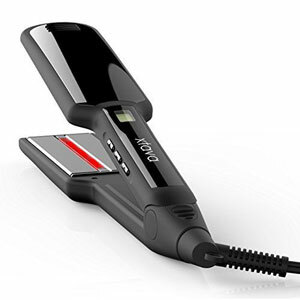 The fact that it has far-infrared heat generation and a low range of temperatures settings are ideal for fine hair. Add to that the fact it has dual voltage capability and a nice temperature lock feature and you have a really good flat iron product here. It’s definitely worth taking a long look at before you make that new flat iron purchase for your fine hair.